My one point is that–throughout the nation–adjunct faculty have become the cheap labor base on which U.S. higher education now stands. I know that U.S. higher education is overly expensive, but it’s not adjunct faculty compensation that makes it so. There is no excuse to pay an adjunct anything less that the equivalent amount that a full-time faculty member receives for the same amount of work. I also am aware that colleges and universities have extended their programs on the backs of this substandard adjunct compensation. They would likely go bankrupt (or would have to severely cut back the number of students they teach), if they depended on their own resources to pay adjuncts fairly. Perhaps some improvement could come from reallocation of their own resources, but that is unlikely to get us very far. The only (though politically very difficult) solution is to tell the American people and their elected representatives (yes, lobbying) that, for all the expenses they are already paying, they are receiving higher education on the cheap–dependent on unconscionable faculty salaries–and through public policies (e.g., progressive taxation) the public has to aid our colleges and universities to end this exploitation. This entry was posted in Politics and tagged ADJUNCTS, EDUCATION, EXPLOITATION, FAIR PAY, LABOR by fshiels. Bookmark the permalink. I wrote this as my main response to a college administration’s (the employers’) survey seeking the feelings and opinions of adjunct faculty concerning adjunct work at its college. 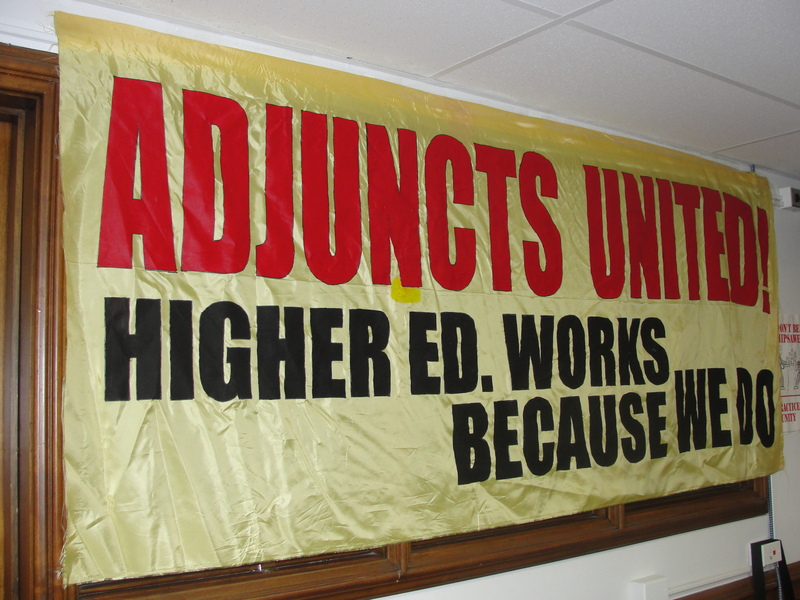 Adjunct faculty, sometimes called contingent faculty, are college teachers who are hired on a semester by semester basis (no long-term job security), to teach one to three courses (less than full-time responsibilities), at as little as one-third of full-time faculty pay—with no monetary benefits. The survey reflected my understanding of employers’ attitudes concerning adjuncts, i.e., “How can we make adjuncts feel an integral part of the college/university’s teaching team by extending to them benefits that cost no (or minimal) money? So the survey asks about classroom materials, integration of adjuncts into regular faculty meetings, special programs and recognition, pedagogical/technological training—while deemphasizing salaries and financial benefits.